Why you need this free software? 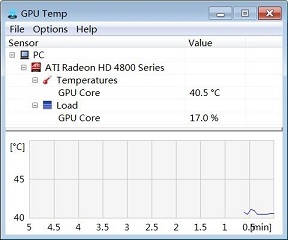 While you play the huge 3D video games or overclock your graphics card, you should worry about graphics card overheating, this small software can actually solve this problem for you. Launch this software, it enables you to keep abreast of the status of graphics when playing game. At the best, it is free to use. The GPU is the abbreviation of "Graphic Processing Unit", the most critical graphics chip. GPU determines the main performance of one graphics card (v vard), is becoming increasingly important. Today, most graphics cards on the market to use ATI or NVIDIA graphics chip, this software can support both.